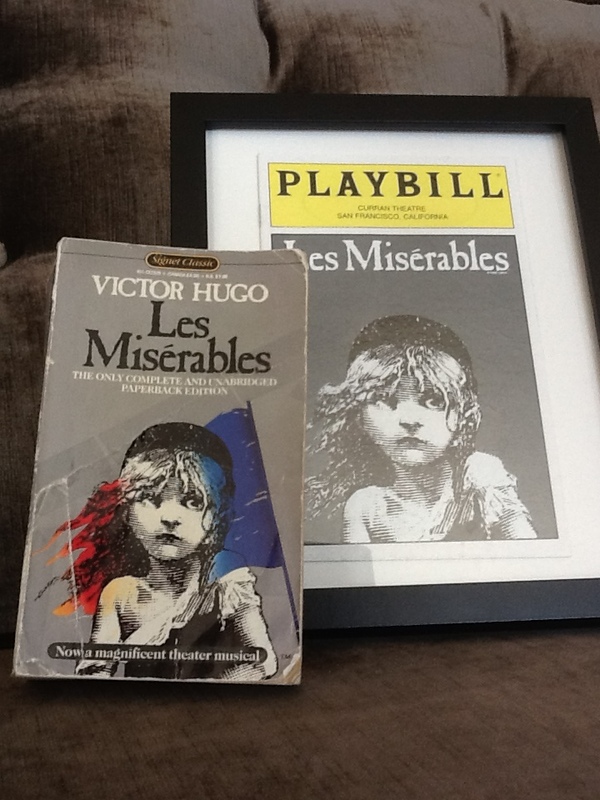 The Music of Les Miserables and the Book (I Guess) – The Bookshelf of Emily J. Yes, my husband read Les Miserables (1862) before I did. Several years before I did, in fact. When we were dating in college, he had to read it for an assigned reading course as part of his master’s degree in accounting. To accomplish this, he brought the book to church with him on Sundays and hid it inside his scripture case. So, while everybody (me included) thought he was extremely pious for so diligently reading the scriptures, he was instead frantically trying to finish the gargantuan novel. The fact that he had read it and I hadn’t was then held over my head for the next five years. Every time I’d finish a novel and search for a new one, he’d suggest with a sly smile that I read Les Miserables. We of course had his copy and it was just sitting on the shelf collecting dust. However, I did not want to read it. I had seen the musical twice. How could the book compare? I’m also not fond of reading a book when I already know the plot (see my post on Alice’s Adventures in Wonderland). That ruins the pleasure of reading and finding out what will happen next. So, I resisted Victor Hugo’s masterpiece, number 100 on the BBC book list. I finally gave in. Not because I wanted to read it, but because I wanted my husband to shut up. I had read approximately 1,000 more books than he had. How dare he continually claim to have read something that I hadn’t! So, I read it. And, I’m not going to lie. I didn’t really like it. Why not? Because I already knew the story. There was no mystery in each turn of the page or any sort of impetus to finish. Reading it took me a few years. I would read a few chapters here and there, get tired of it, and put it aside. I did that over and over until I finally finished it. Does that mean that Les Miserables is not a good book. Of course not! It means that I have a short attention span and a ridiculous need to be constantly entertained. The fault lies within me, for Hugo’s novel is fantastic. The story of redemption is most touching. Jean Valjean characterizes the notion that we all deserve a second change. We are all beggars in the eyes of God, so who are we to judge another? Valjean can represent each of us, sinners all, who need a chance to prove ourselves and our worth once more. He gets this chance, does it well, and eventually must face the reality of his past before continuing to move forward. His adopted daughter Cosette is another compelling figure. She had endured poverty, abandonment, and mistreatment for most of her childhood. Yet, she grows up to be a sweet and loving person, without bitterness or guile. This is a lesson to me. There are things in my past that I absolutely abhor. There are reasons for me to be bitter, unkind, unforgiving, and mean. Cosette is my example of letting that past go and moving forward. I know who I want to be – patient, loving, kind, genuine – and I can be that person. I can choose to be that person. I’m not good at it yet, but with practice, I will become that person. If Cosette can do it, anybody can. The novel’s depiction of the French Revolution is also fascinating. These men are willing to die for their cause of freedom. This is a trait venerated in American society because of our own revolution. It is a trait that I’m unsure of possessing. Would I die for freedom? Would I die to ensure the freedom of others? The men in the book would, and for that bravery they are worth our time. I must admit that several of the chapters about their preparations are somewhat boring, along with the many chapters about the layout of the sewer system, but those chapters also serve a purpose. They set the scene, give us background information, and probably make any tour of the underground of Paris more fascinating. Gaoliath was a bruiser who was tall as the sky. Of the Pope in Rome! I think my favorite parts are the interlude and the chorus. My other favorite song from the musical is “Do You Hear the People Sing?” My heart just swells when I hear this one, kind of the same way it does when I hear an exquisite rendition of “The Star-Spangled Banner.” My dad’s favorite song is “Stars.” I learned to play this one just for him. And it is gorgeous. The arpeggios perfectly echo the anguish Javert is feeling. His words represent the idea of paying the price for sin, but without redemption. Javert’s attitude is a perfect match to Jean Valjean’s life. Between these two characters, we learn about true Christianity, that sinners must suffer but not if they repent. Both sides of the atonement are presented through these two characters. Have you read Les Miserables? Did you like it more than I did? What is your favorite song from the play and why? And, has anybody seen the movie? How does that compare? I’ve never read the book either, but the Broadway play is fantastic. Even those who don’t enjoy musicals couldn’t resist the sweeping, patriotic feel of the stage version. I remember seeing the play for the first time and feeling so moved during the battle scene when they waved a HUGE “tricoleur” French flag. The French revolution is so closely connected to our own, and the ideals of the founders of the United States were influenced, borrowed, and rewritten as American ideals. It’s still very evident walking around the streets of France today. On our recent trip, I was struck by the anti-monarchy history of France. In many of places we visited, statues of kings had been defaced or removed, and plaques reading, “Fraternite, egalite, liberte” (Brotherhood, equality and liberty) were posted in their place. On the one hand, it’s sad to see historical buildings and statues torn down. On the other, as Americans we naturally reject the idea of royalty and monarchy, and the French were instrumental in helping us physically reject the British monarchy during the Revolutionary War. Well said. I love how you tie French and American ideals together. I totally agree! I love both the book and the musical. I was in the pit band for my high school’s production of Les Mis a few years ago and that sparked the interest. I read the novel the following summer and am reading it again (very slowly on my phone while waiting in lines and such). I loved the book. It is a lot to get through and it does have some slower moments, but I think it was wonderful, as is the stage production. “Little People” is one of my favourites from the production, but my number one favourite is “Master of the House” because it is hilarious and it has an awesome little saxophone part. Ah, “Master of the House.” I love that one, too. It is funny. It has great lyrics, and when tied to wonderful acting, it is a showstopper. Thanks for the reminder of that one. I too learned to play all the songs on the piano, and sing them endlessly. They are all my favorite except for “Master of the House”, and one that isn’t in the songbook, “Lovely Ladies”. Those give me the heebie-jeebies, I just don’t like singing along, if you know what I mean. One of the most true and beautiful things ever done in the genre. Yes, the music is so beautiful. I think that’s why it has endured. It is my favorite play. And, I’m not surprised you beat me. I bet you’ve beat me to a lot of books! I made my way through the “LONG” version of this amazing work in High School… I loved parts of it… but I later learned that most authors would be compensated by the page….. and that is why there is hundred of pages of useless information….. like the excruciating details of the french underground tunnels. This is almost certainly the only book that I have read before you. But you did see the Broadway play before we saw it together in San Francisco. Yes, and Lord of the Rings! I love this post and all the comments…thank you. My children play in “les misérables” here in France. It is a musical run by a french non-professional troop in an association named “compagnie gavroche” which it’s leader is a very enthusiastic french fireman! They raise money for sick children. How wonderful! Thanks for sharing. What an authentic experience your children must be having. Pingback: Depth and Reflection in The Wind in the Willows | The Bookshelf of Emily J.